Special Promotion: Stay 7 For 5! From October 1 through December, you can take advantage of River Island's Stay 7 for 5 promotion. Purchase 5 regular nights of camping and get 2 additional nights for free. You MUST call Reservation Center (520) 586-2283 and mention this promotion. (Please note you can't reserve this promotion using the online system — you must call Reservation Center). River Island Now Offers 24/7 Online Campground Reservations! High Speed WiFi Internet access available! 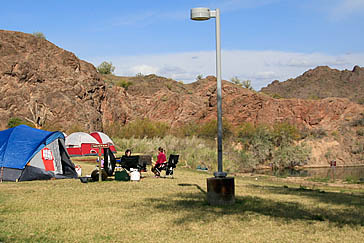 River Island offers 37 campsites on the Colorado River. Select sites for tent camping are right on the river. River Island State Park is ideal for tent campers and can provide a scenic respite, a desert escape, or a fun-filled water adventure. It offers 37 campsites, a ramada, sandy beach, cove, and boat launch area. The park has a trail for hiking and access to OHV back country roads. The River Island Market, located 1/4 mile outside the park, offers groceries, food deli, gas, clothing boutique and storage. In the summer, the park unit is most popular for boating, fishing, jet skiing, swimming, and camping amidst a backdrop of beautiful mountains. In the winter, visitors appreciate the mild climate and enjoy camping and fishing. River Island State Park is a year-round destination for those looking to discover a variety of recreational and cultural resources. Schedule subject to change. All outdoor programs are weather permitting.Programs are free with park admission, except Nature Hikes which have an additional $2 fee per person.